Sagarmatha - "Mother of the Universe" - The allure of Mt. 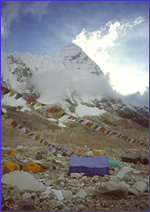 Everest is well known throughout the world. Sir Edmund Hillary and Sherpa Tenzing Norgay first reached the summit of the world's highest peak via the treacherous Khumbu Icefall in May, 1953. It is Norgay who said, "The pull of Everest was stronger for me than any force on the earth." This classic trek into the Solu-Khumbu region begins with a spectacular mountain flight to Lukla. Over the next few days trekking along the Dudh Kosi ("Milk River"), we will make our ascent into Sagarmatha (Everest) National Park and to the Sherpa capital Namche Bazaar. Here we will take a couple of days to rest and explore. To aid acclimatization, you can day hike to Khumjung village where you can visit the Hillary school, have fresh bread at the world's highest bakery and explore the area on your own. We'll rise early to watch the sunrise color Everest, Ama Dablam, Lhotse, Thamserku and the surrounding peaks. From Namche, we will continue on to Tengboche. With its beautiful Buddhist monastery, this small village is considered the spiritual center of the Khumbu area. We will gradually make our ascent to Dengboche, Lobuche and finally along the glacial moraine to Gorak Shep at the base of Kala Pattar, staying a couple of days for exploration and acclimatization. You will have the option of an sunset or sunrise trek to the 18,188' summit of Kala Pattar for a panoramic view of some of the world's highest mountains including Everest at 29,035', Nuptse and Pumori. We'll make the 3-hour trek on to Everest Base Camp where, depending on season, you'll see mountaineering expeditions preparing for their ascent to the highest peak in the world, beginning with the spectacular Khumbu Icefall. Enjoy the holidays in the Khumbu - our December 20th trek. Our team will be Sherpa supported, with porters and/or yaks to carry gear while you hike with a light day pack, allowing you to acclimate and enjoy the trip to the max. Our experienced staff will trek with the group, set up the tents, cook all the food, which includes excellent Western and local cuisine, and provide support for all levels of ability and interest. This trek includes 2 days accommodation in Kathmandu before and after your trek and a tour of Nepal's bustling capital.